I’m a voracious reader, and read between 80 and 100 books a year. Obviously, this is a habit that gets expensive so I’m always looking for legal ways to still read and cut back on the spending. Until I got my iPad in 2010, I was a frequent customer of my town’s library. Once I got hooked on digital books, however, I never really went back. Some of this is due to the fact that I live in a very small town (about 5,000 people). I often joke that there are more cows on my street than people. So, my library is very small. While we are tied into a regional network of libraries, the next closest library is still two towns over. Thankfully, my library joined the digital age and I can check out books digitally. This is a big deal for them, since the last time I asked them if I could borrow Kindle books, the woman at the desk said “yep” and handed me an actual Kindle. Most libraries (at least in the United States) use Overdrive as their ebook library solution. From what I can tell it’s usually tied into a library network like the Minuteman Library Network. Your library will own ebooks. However, unlike the Amazon Prime Lending Library (we’ll be visiting Amazon again by the time we’re done), people can only check out as many copies of an ebook as your library owns. So, if your library only has one electronic copy of the new John Sandford book, only one person can check out the book at a time. What is nice, though, is you can place a hold on a title and it will automatically be checked out to you when it’s available. The first step is to go to the closest branch of your library, make sure they have a digital library, and get a library card if you don’t have one. They will usually give you a pamphlet with the actual website to access the ebook. One there, you will need to create an account and link your library card number to it. You will then be able to browse the selections on your computer, iOS or Android device. When you search on a title you will get one of three possible results: the title cannot be found; the title is available, but is currently checked out; or the title is available for check out. 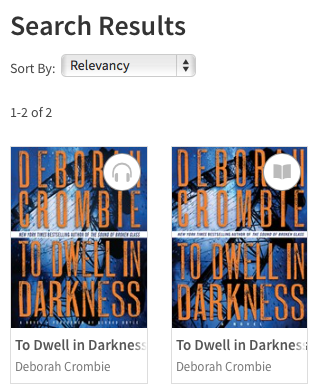 If the title is available for borrowing, it will have a solid black book icon; if it’s already checked out, it will have a gray book icon. Holding books is pretty easy. Press the book icon, choose Place a Hold and your selection will be placed on hold and you’ll get an email when its ready. You can go to the Holds section of your account to see where you are in the queue. At first, I was disappointed in the selection. I went through my Amazon wish list and struck out looking. After thinking about it, I realized my wish list is mostly made of pretty obscure books. I love baseball statistics, and my wish list has a lot of stats books. My wish list is also comprised of books that I might not get myself, but are perfect gift books for the holidays. So, as a control, I searched on the current New York Times best seller list for hardcover fiction. Of the 15 books listed, 13 were in the library. Those were a little bit better odds. That said, none of them were actually available, so I would have had to place a hold on them. To check out a book, press the book icon and choose Borrow. The book will then appear on your bookshelf and is ready for download. To be honest, the downloading part is what confused me, and provided the impetus for writing this article. Most tiles let you download either a Kindle or Adobe EPUB version. My first thought was: I have a blanketyblank iPad. How can I download a blanketyblank ebook on a device with no blanketyblank file system. Undeterred, but a little cautious, I pressed Download Kindle book. Thankfully, instead of downloading a .azw file, it brought me to the Amazon website. From there it registered the book in my Kindle list and I was able to download it. I highly recommend using Amazon as the content provider for your checkouts. 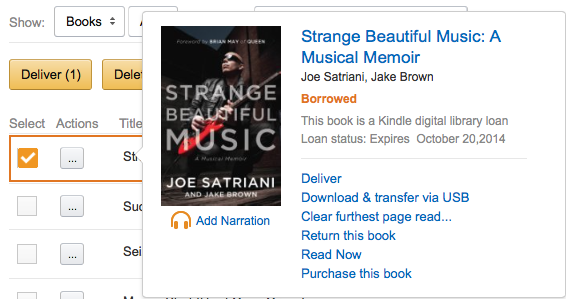 To return the book when you are done, you can go to Manage Your Content and Devices in your Amazon account, check the title and choose Return This Book. I prefer using Amazon because I don’t need to mess around with any other apps. I just go to my Amazon account, download the book and read it. How long you can keep a book checked out depends on your library. Mine has a 14-day borrowing time limit; my mom’s has a 21-day period. She can also check out more books than I can: 10 to my 7. In the month or so since I signed up for this, I’ve been very happy. I’ve read about 8 books, and discovered a great detective series I wouldn’t have likely found on my own. While there are subscription services like Oyster Books and Kindle Unlimited, a lot of these services haven’t signed deals with the major publishers. That means the odds of a new title appearing are greater via my hometown library. I don’t mind the wait. I have enjoyed reading titles from my local library using my iPhone, Kindle app, and VoiceOver screen reader. Tonight I found that I can no longer search for Kindle format titles, and it looked like the system was moving toward the Overdrive app exclusively. Overdrive does not seem to work well with VoiceOver. It’s necessary to exit from VoiceOver to advance from one chapter to the next. Am I missing something? Any suggestions? I have Overdrive downloaded, including all updates. Following borrowing the book, I have two choices. One is to download to Overdrive. The second is to read it in my browser. I have been using Overdrive on my 1st generation iPad. I downloaded a book from the library about a week ago, and when I went to read it today, I get a message saying the app has been updated. I went to the Apple store, and the app is available for IOS 6 and greater. I cannot upgrade to IOS 6. Any idea how I can get around this problem? I use Bluefire Reader on my ipad. 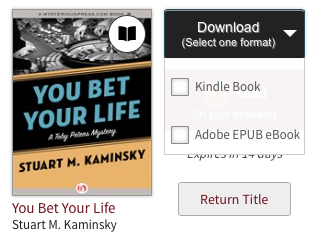 It’s free and let’s me download DRM books straight from the library as epubs or pdfs. Checkout, download, read – couldn’t be easier. And I don’t have to go through Amazon or any other website. 1. Get a library card from cities that you visit. Here in Colorado we can get a card from any city. Remember that when you check out a book, you don’t have to be there. 2. If you have any friends in a big city, ask them for their library card numbers. This works exceptionally well if your friend lives in one of the cities that has the biggest selection of ebooks. What about Android Tablets? The iPad isn’t the only tablet, so you can’t assume everyone uses Apple. So, you should have Android in the keywords at top and picture an Android Tablet such as the Nexus 7. Hi David- (Full disclosure: I work for OverDrive)- You can use just about any device w/ OverDrive. We have an app that works on Android, Apple and much more. You can learn mroe here: http://omc.overdrive.com/ or just search for OverDrive in your app store. One there, you will need to create an account and link your library card number to it. You will then be able to browse the selections on your computer, iOS or Android device. Two comments. First, check with your library to see if they have reciprocal agreements with neighboring libraries and sign up with them as well – it increases the chances of finding the book you want although you will have to search separately. Second, ask about magazines – my library allows downloads of a boatload of magazines through Zinio.